BAGHDAD, Iraq (CNN) -- A U.S. Marine and a soldier were shot to death Tuesday while conducting a humanitarian mission north of Baghdad, the U.S. military said. Protesters demonstrate Friday in downtown Baghdad against a deal to keep U.S. forces in Iraq. Another two Marines and three civilians also were wounded in the attack, which occurred in Baaj, in the northern province of Nineveh, the military said. Military officials said the unit came under fire from two men -- one of whom appeared to be wearing an Iraqi military uniform. "The attack appears to have been unprovoked," said Col. Bill Buckner, spokesman for the Multi-National Corps-Iraq. "It is unknown if the attacker was an Iraqi soldier or an insurgent in disguise." The incident is under investigation and the names of the U.S. troops are being withheld until their families are notified. Sixteen U.S. troops have been killed in Iraq in November, bringing the total number of U.S. service member deaths in the Iraq war to 4,206. The latest deaths occurred on the eve of a parliamentary vote on a proposed security pact between the United States and Iraq that sets out the role of U.S. and allied troops in Iraq. The Iraqi government approved the Status of Forces Agreement the Sunday before last, sending the measure to parliament to be debated. Reached after months of negotiations between Iraqi and U.S. representatives, the pact sets June 30, 2009, as the deadline for U.S. combat troops to withdraw from all Iraqi cities and towns. The date for all U.S. troops to leave Iraq altogether would be December 31, 2011. The measure has been met with protests from some Iraqis, most of whom are backers of anti-American Shiite cleric Muqtada al-Sadr. The Sadrists are among the most ardent critics of the deal, and others -- such as Sunni Arabs and secularists -- have expressed reservations and opposition to the pact. The Sadrists oppose having any agreement with the United States and want U.S. forces to leave immediately. 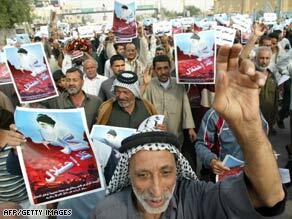 They took to the streets of Baghdad in protest this weekend, waving Iraqi flags and carrying signs scorning the agreement.